The last night of April 1971 was a thrilling one for a certain 13-year-old who lived an hour north of Milwaukee. That Friday night, my beloved Milwaukee Bucks defeated the Baltimore Bullets 118-106 to win the NBA championship. One of the Bucks’ stars was center Lew Alcindor, who had just turned 24. The next day, Alcindor announced that he would thereafter be known as Kareem Abdul-Jabbar. Today, my friend Kurt — also a big fan of those Bucks — tipped me to a wonderful essay written by Kareem, now 66. Posted by Esquire, “20 Things I Wish I’d Known When I was 30” is well worth your time. So I wonder. Did Kareem, now writing for Esquire, ever cross paths with the Esquires during his six years in Milwaukee? Kareem was, and is, a jazz buff. But did he ever hear, and appreciate, one of the city’s top soul and R&B groups? The Esquires, a vocal group many compare to — and mistake for — Curtis Mayfield and the Impressions, had a smash single with “Get On Up” in 1967. Lew Alcindor didn’t arrive in town until two years later, when the Esquires were making their last serious run at the R&B charts with the singles “I Don’t Know” in 1969 and “Girls In The City” in 1970. So tonight on The Midnight Tracker, materializing from the sweet blue haze of time (and smoke from the corridors of the Milwaukee Arena), is a sweet side from one of Milwaukee’s finest groups. 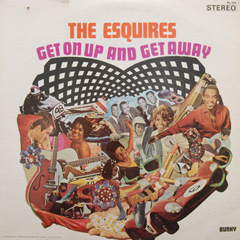 “And Get Away,” “Listen To Me,” “How Was I To Know,” “Groovin’,” “Everybody’s Laughing” and “How Could It Be,” the Esquires, from “Get On Up And Get Away,” 1967. This is Side 1. It runs 14:49. This was the Esquires’ only LP. It’s available on a 1995 CD titled “Get On Up” and digitally. This side leads off with the follow-up single to “Get On Up.” They were released in July and September 1967, both reaching the Top 10 on the R&B charts. The second cut, “Listen To Me,” was the B side to “Get On Up.” The fifth cut, “Everybody’s Laughing,” was the B side to “And Get Away.” “Groovin'” is a cover of the Young Rascals tune. Everything else on this side was written or co-written by lead singer Gilbert Moorer. Consider this the digital version of the latter.